I feel like I have lost a very close friend however I have never actually met Robert Genn. I have for a few years looked forward to receiving the twice weekly newsletter that he sends out to artists around the world. They were at times inspirational, philosophical, spiritual, informative or thought provoking and usually all of these. He will be missed by many. Onward to happier things. Maybe. I haven't been posting however I have been painting a lot. Just not very successfully. Boats and buildings are not my forte and I question whether I should paint more of them to get better or just keep working at what I do well. This first sketch is Vivian. She is one of my favourite models and often poses for the BFAA sketch group. She sits well, has big dark eyes that are very intense and yet warm and humorous and a face with lots of character. I don't have a perfect likeness but I am happy with it. ages with the perspective of the house with the addition at the back and the porch on the front. I chose a very awkward angle. I finally got the perspective right but I ran out of time so this painting isn't and probably never will be finished. This last sketch was done at camp on Saturday. This is another one of the nature centre at Scout Camp Nemo. I plan on sketching more locations around camp and then using the images to print up note cards to be sold as a fundraiser for the camp. We shall see how far I get. Debbie and I spent an amazing weekend at Niagara-on-the-Lake. 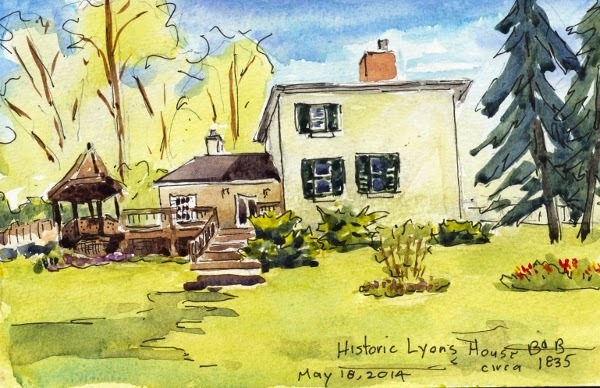 We arrived Friday night to a very warm welcome at the Historic Lyons House Bed and Breakfast. Howard and Yolanta are fantastic hosts and made us feel instantly at home. I didn't have time to paint full paintings but I did some sketches. These first two are the front and back of the B&B. I would stay here again in a flash. Everything about our stay was absolutely perfect. If there hadn't been so many things to do in town we could happily spend the long weekend in the back garden. On Saturday we wandered the town and then visited Fort George which was an interesting step back in time. 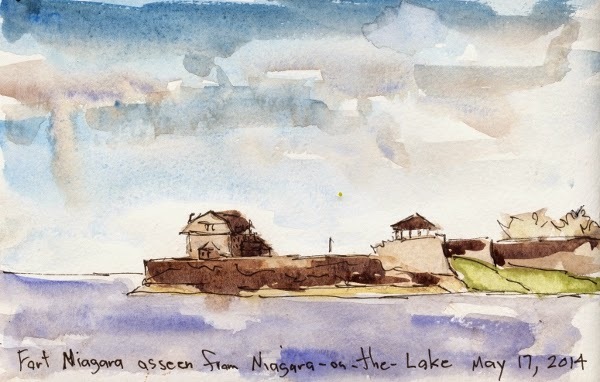 We wandered some more and ended up at The Queen's Royal Park which had a magnificent view of fort Niagara across the river. From here we headed to the Prince of Wales Hotel for high tea. They were full and there was an hour wait until we could get a seat so Debbie went shopping and I plopped down on my stool across the street and sketched the hotel. I was getting tired so this is a pretty weak sketch of a very busy building. The huge pick up truck that parked in front of me didn't help. After high tea we went back to our room for a nap before heading to the Shaw Festival Theatre to see Cabaret. It was incredibly well done but a bit macabre for vacation watching. We spent Sunday on a delicious wine tour that took us to five wineries followed by seafood pene in The Old Angel Inn for supper. The inn was very British and was established in 1886. It really was an amazing weekend and even better since it was a Christmas present from our children. This winter being a Scout Leader started becoming a chore for me. The politics was wearing me down and as I got more and more involved in the art world committing myself to camp every Saturday became impossible. And then yesterday happened. I was at camp sitting on the deck of the HICOP (the nature centre where I volunteer) listening to the giggling and laughter of youth playing in the camp and watching crows chasing a soaring hawk out of their territory. The only place in the world that I would rather be is in my own back yard relaxing with Debbie and a glass of wine. I sat in a tee shirt in the sun and painted this sketch of the nature centre signs and one of our bird feeders. This is 5" X 7" and painted in a cheap watercolour book but it was relaxing and fun. Days like yesterday I can't imagine giving up volunteering and I am sure that a balance can be found. When all else seems to be failing it is good to get back to basics and do something that is fun. 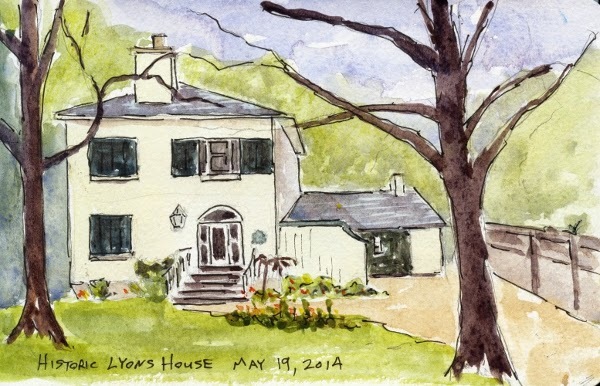 This urban location was where the Burlington Fine Art Association plein air group met to paint today. I am not fond of painting urban scenes so I decided to sketch. 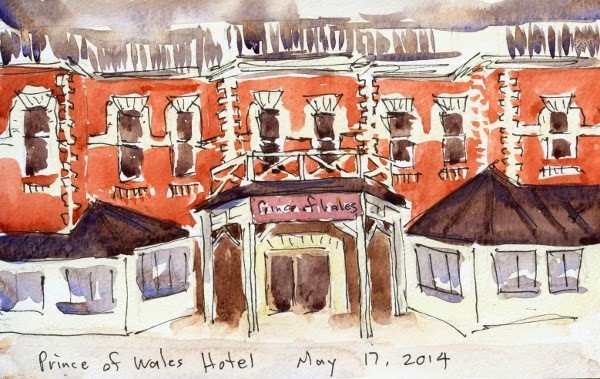 I will never be a serious urban sketcher but it is fun to plop down on a stool and play. Lock Street is a very busy and very friendly street so there were lots of distractions but that is part of the joy of urban scenes. I didn't realize that Vanessa was sitting there painting until the car that was parked in front of her left so I added her in. Today was such a joy that I may start wandering Dundas with my little backpack and stool. Some days a painting as much as paints itself and other days nothing works. Often the days that I don't feel like painting at all produce my best work. More often than not I start with a subject that I love and a great attitude and it all heads south. I often love the composition and draw it out quite well and then when I start to paint I forget to look at my subject. That was the case on Monday. I was excited about all the shapes of the many boats on cradles waiting their turn to get lifted into the water. No masts or rigging just the various curves of all the hulls. I drew this painting out and was really excited about it. The problem is that by the time I got all the shapes drawn in I was mentally pretty tired. I should have gone for a walk and munched on my apple but instead I pushed on. By the time I had blocked in all the shapes of the boats I was in no shape to focus on the many shapes in the buildings and I just threw them in. When I got to the highlights, reflections in the hull and details I had nothing left and totally lost it. It was a good day to be outside and I was painting with friends so the day wasn't a total loss. One artist was half way through her painting when a crane came along and removed her subject. Oh to have that excuse. This is about the third time that I have painted Bernie and he is one of my favourite models. When he is posing he is like a statue which makes it very easy for us. This is my first sketch of Bernie. There were less than a dozen of us in the studio today so there was lots of elbow room. Bernie has a gleam in his eyes that makes you think that he is up to no good but he is a kind hearted soul and a pleasure to work with. He sits for half an hour at a time with ten minute breaks in between sittings. This took me two sittings so about an hour of actual work to complete. I remembered my camera so here is the view of Bernie that I had from my easel. I completed two sketches in the three hours in the studio but the second one is never very good because I am very tired mentally after the first one and I find it hard to focus. This is the second sketch. Not terrible but not really great either. Painting for me, especially portraits requires that I focus very intently on what I am doing and I have the attention span of about a two year old so three hours in the studio is a bit of a stretch.